In grade 10 I decided to take drama class as my fine arts requirement, it was the first year it was being offered at my school and I thought – ok, drama! Let’s do this! Everyone sits in a circle; two people stand in the middle of the circle and start acting out a scene, anyone from the circle can shout out “freeze” at any time and the two actors stop what they’re doing and hold their position. The person who interrupted them must tap either of them on the shoulder and replace them holding the exact same position. When the actors unfreeze they are in a new scenario (that makes sense based on the position the actors were frozen in) and must act that out until someone yells “freeze” again. For example: The two actors in the middle are in a scene about making a cake and the oven catches on fire, someone from the circle yells “freeze”, replaces one of the actors, and when they resume play they are in a scene where they are bandits riding horses after robbing a bank. It’s a fun game, try it with your campers. But here’s the really cool thing about the game. My drama teacher explained that in order for this game to work, we need to embrace whatever scene is thrown at us, we just have to go with it, we have to say “yes”. 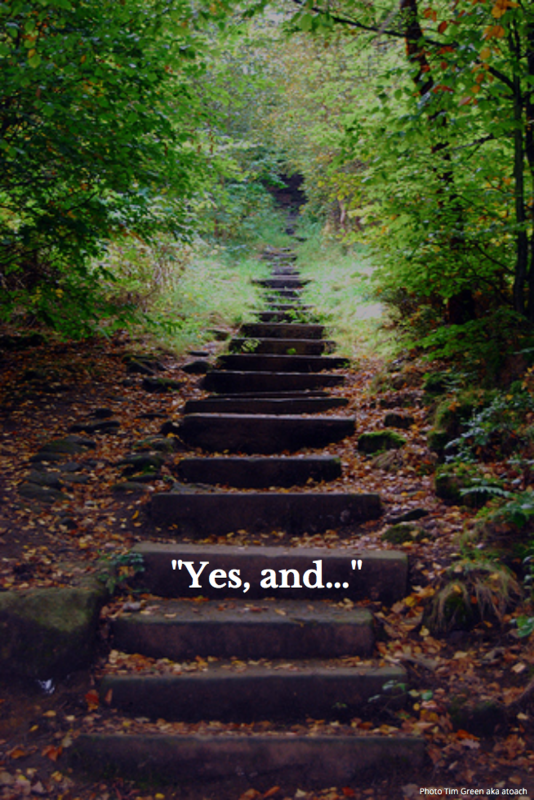 I’ve been thinking about this a lot lately, and I’ve really embraced the “Yes, and…” philosophy in my life. I’ve been saying “Yes!” to a lot of opportunities lately, and some pretty cool stuff has been happening because of that, and I think that as leaders we need to say “yes” more often. So I challenge you to adopt the “Yes, and…” philosophy at your camp and in your life. Let’s try to say yes to our staff and campers as much as possible, they have some phenomenal ideas, let’s look for ways to make them work. To those suggestions I would say “Hey! Thanks so much for your suggestion, I love that you’re so enthusiastic and thinking about ways to improve camp! Can you think of a few other ways we can encourage camper independence/ create a super fun all camp activity/ cultivate staff bonding, and then we can chat about it some more? Then when they had some other suggestions I would walk them through some of the ideas, “ok, tell me more about your jello, bubbles, Royal Rumble plan” * and hopefully be able to walk them to an idea that is less dangerous, wasteful, and destructive to camp property – like a carnival with a jello toss, pudding drop, or dunk tank. With the hot tub idea I might say “Yes!” We have $30.00 in the budget for something like that, can you come up with something? To which I would hope they’d show up with some kiddie pools, filled with hot water and bubbles, rubber ducks, and water wings for some hilarious staff bonding moments. So the “Yes… and” idea doesn’t mean that you have to blindly say yes to everything, it’s just a great way of making sure you’re not missing out on some amazing opportunities. I’d love to hear about how you embrace the “yes, and…” philosophy and how it’s impacted your life/ career/ leadership style. Tell me about it in the comment section below. *Are these types of phrases uttered in any other profession? I love my job.